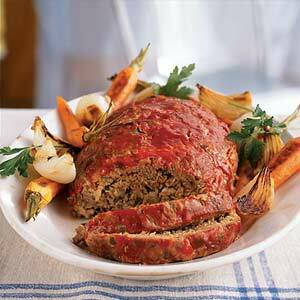 Meatloaf is a great comfort food, but not necessarily the healthiest. It is packed full of fat and calories from the red meat. So instead of using read meat we recommend that you use ground turkey, or even better – tofurkey. Not only has this recipe been converted to cater to a healthier meat, or lack of meat, selection but it also contains a serving of goji berries. Goji berries are high in protein, fiber, and carbs. They promote vitality, longevity and energy. What’s not to love about them? Check out the recipe for more. Preheat oven to 375 degrees. Mix all of your meatloaf ingredients together in a bowl. Pour the meat mixture into a bread loaf pan. Stab the meat a few times with a fork. Bake the meat loaf for 35-40 minutes, depending on your oven. While the meatloaf is baking, mix together the glaze. Remove the meatloaf from the oven then pour on the glaze topping. Make sure to spread the glaze out evenly over the surface of the meatloaf. Bake the meatloaf for another 10 minutes. After finished cooking, remove the meatloaf from the oven and let it stand for 5-10 minutes before serving. This is a healthy alternative to your typical red meat meatloaf. It is delicious and is packed full of a serving of goji berries – a very important superfood. This recipe comes to us from Goji Berries US and has been modified in order to ensure that you are putting the absolute best into your body.